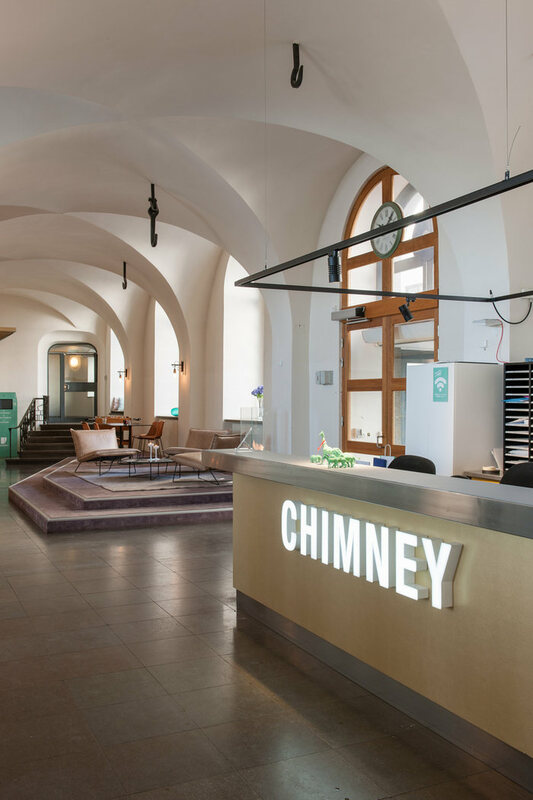 pS Arkitektur has created the new offices of editing and visual effects company Chimney located in Stockholm, Sweden. Chimney Studios are storytellers at heart and use film and communication expertise to produce over 6’000 outputs for more than 60 countries every year. The work covers each step of the creation process, from the conception through development, production and world class post production. Areas include feature films, commercials and TV. Founded in Stockholm in 1995 and now engaging 300 employees in offices in 10 countries. The Stockholm office employs some 190 people. The challenge was to fit this friendly, open minded, top-of-the-art technical and busy company into an 18th century classified building in Stockholm’s old town. The entrance level houses a great lobby under the vaults. This is where you meet colleagues, have lunch or work over a cup of coffee. Foreign visitors from the film industry enjoy the cool atmosphere and the professionalism from staff and studios. The design concept is the Chimney Family – welcoming, professional and sporting gifts and souvenirs from all over the world. The interior is a mix of second hand and new furniture. Chimney Studios occupy seven stories of the building. Basically no alterations on existing structures were allowed. Light fittings and acoustic panels had to be fitted so as not to make any permanent impact. Besides office spaces it houses a first class cinema, sound studios, editing suites and mixing studios. All of these are totally in-site built light- and sound insulated units.